The Reserve Bank of Fiji is going to issue a coin to commemorate the county's first ever medal win on the Olympic Games. Earlier today Fiji won a gold medal by beating Great Britain in the rugby final. The government of the country has declared the 12th of August a national holiday. In 2013 Fiji for the first time won a medal in the Paralympic Games. At the time they issued a circulating commemorative 50 cents coin featuring Iliesa Delana to celebrate that he had won a gold medal in high jump. Excellent occasion to issue a commemorative coin. May they win many more medals! In 2013 Fiji for the first time won a medal in the Paralympic Games. At the time they issued a circulating commemorative 50 cents coin featuring Iliesa Delana to celebrate that he had won a gold medal in high jump. It is now also known that it will be a coloured commemorative circulating coin. Only a limited number of the coins will be minted. They will be issued in the first half of 2017. The design is currently being finalised. The coin will have a denomimation of 50 cents and will be coloured blue. The coins and notes were issued today. In contrary to what was earlier officially announced by the Reserve Bank of Fiji, the coins are not coloured. This was possibly done because of the tight schedule. The coins were minted at the Royal Canadian Mint. The unveiling event was streamed live on Facebook. 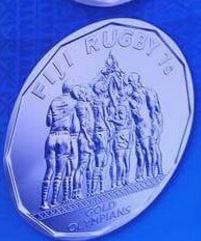 Two million $7 banknotes and one million fifty cents coins have been printed to commemorate the gold medal win of the Fiji 7s team at the 2016 Rio Olympics. Speaking at the launch of the commemorative banknote and coin, Prime Minister Voreqe Bainimarama says this commemoration is an acknowledgement, not only of the tremendous feat the coach and players have accomplished but for the meaning it held for every Fijian man, woman and child. Bainimarama says that victory is immortalised with the launch of a commemorative banknote and coin that honour our players, coaches and staff and give their victory the ever-lasting place in our history it deserves. He says that in 2012, we honoured the now Assistant Minister for Sports, Iliesa Delana’s, gold medal victory at the Paralympics with a commemorative coin because his victory embodied the resilience, determination and tenacity of the Fijian spirit. Bainimarama says it was an achievement that showed the world that, regardless of our small size, we can compete with the best of the best in sport. He says today, we are honouring the coaches and players on our world-champion Sevens side in the same fashion. 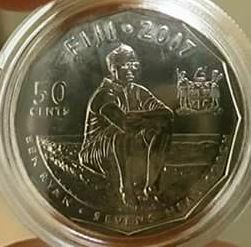 Reserve Bank of Fiji Governor Barry Whiteside apologised to the people that as promised earlier of a painted coin will not come to fruition this time. Whiteside says unfortunately technological limitations and despite their best efforts, they were advised that there was high possibility that the paint will come off the coins with constant circulation. The banknotes and the coins will be issued through commercial bank branches from tomorrow. with the appropriate colours (one of them being red! I wonder why?). Unfortunately technological limitations began to “bite” us and we were told that only one side of the coin could be painted. Our wish, of course, was to have both sides painted. We even explored painting equal quantities of each side of the coin. But despite our best efforts, it was not to be and we were advised that there was high possibility that the paint would come off the coins with constant circulation. 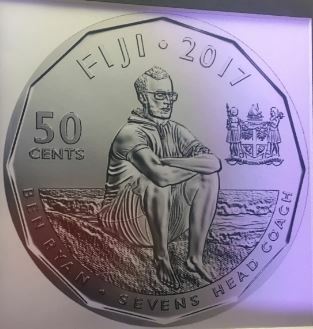 We wanted to deliver to the people of Fiji a coin that would keep them proudly reminiscing of our victory in Rio and I must apologise that this earlier promise of a painted coin will not come to fruition at this time. So we were then compelled to re-think this pledge. Rather than totally forsaking the project, we decided to have at least something for everyone at the lowest cost possible - something that our children could get their hands on and hold on to. For that reason, we had to temper our wishes and settle to issue non-painted coins in the same elegant designs that were earlier selected. I acknowledge that many would be disappointed at not having the painted coin, like we ourselves are. However, I hope what will be unveiled today will be to the liking of all Fijians.